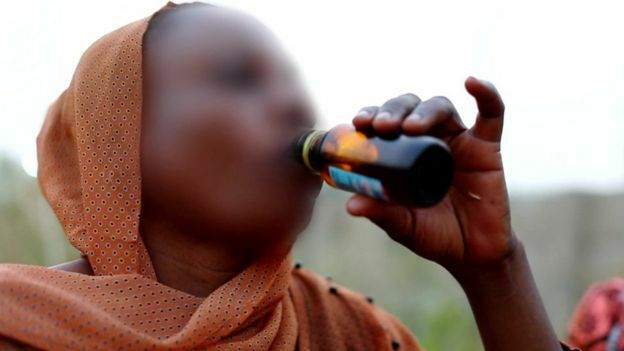 Four pharmaceutical companies have been raided in Nigeria after a BBC investigation into the role of cough syrup containing codeine in an addiction epidemic. The firms are in Lagos, Ilorin and Kano, the National Agency for Food and Drug Administration and Control said. Nigeria this week announced a ban on the production and import of the syrup. The probe recorded a number of pharmaceutical employees selling the drug illegally. Prices of the syrup on the black market have shot up since the ban. Excessive consumption of codeine can cause organ failure and schizophrenia. How were the raids carried out? “Our inspection and enforcement teams are in the premises of the four pharmaceutical companies that were shown in the [BBC] video,” Prof Mojisola Adeyeye, who heads the Nafdac, told Nigeria’s Vanguard newspaper. “Our officials are there putting things on hold, and everything is being documented. When completed, we will prepare our report and then we will take appropriate action. “If products that are fake or substandard are discovered, such products will be seized and destroyed. “These companies that were caught, from our records, have a limited amount of codeine, but from what the documentary showed there is indication that the production is more than the quantity that was approved. So the question can be asked, was there smuggling involved?” Prof Adeyeye said. The companies have so far made no public comment on the issue. What do we know about the ban? The BBC investigation was carried out by BBC Pidgin and Africa Eye, a new investigation unit. The probe prompted a swift response from people across the country, including Nigeria’s first lady, Aisha Buhari, who said in an Instagram post she was “deeply saddened” by the rise of the problem. While existing stocks could be sold, manufacturers in Nigeria “have been told by federal government not to use codeine in cough syrup”, Mr Oshundun told the BBC. “Those that want to import the substance, it is been banned now. It is completely banned,” he added. “Do you know what you have done?” asked Sola Oyekanmi frantically. “The street price of codeine cough syrup has shot up to 5,000 naira ($14; £10)!” said the Lagos-based media executive with ears on the street. Just a month ago, drug dealers were selling codeine cough syrup on the street for up to 3,000 naira. The dark addictive syrup has turned to gold. “You need to understand that the ban on codeine cough syrup is already driving up the price in the black market,” explained Oyekanmi. The ban came after BBC Pidgin and Africa Eye’s undercover documentary Sweet Sweet Codeine hit Nigerian and African TV screens. I spent five months on the project, gathering damning evidence that figures in our pharmaceutical industry illegally sell the opioid syrup direct to the black market. A digital cut-down of our documentary, which showed shocking scenes of addicts in a rehab centre clapped in chains, went viral in West Africa. The cough syrup was legal in Nigeria. But it was against the law to sell it to people without a doctor’s prescription.